Azayra Ouzounian is currently studying violin at Baylor University under the direction of Dr. Bruce Berg. She is planning on graduating in December of 2020 with her Bachelor of Music Education. She has been playing the violin since she was six years old and has been in various orchestras since she was 11 years old. 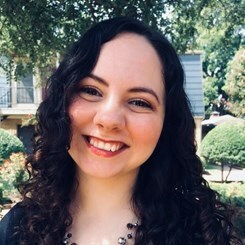 Azayra attended The Woodlands High School in The Woodlands, Texas where she was the concertmaster of the highest ranked orchestra her senior year. Azayra was a member of the auditioned region orchestra from eighth grade through senior year of high school. She also performed in the Texas State Solo and Ensemble Competition where she received the highest rating of a one on two seperate occasions. Azayra has been teaching the violin for about six years and loves sharing her love of music with others. Azayra grew up in The Woodlands, Texas with her five younger siblings and parents. She has been surrounded by music throughout her life as her father is a professional pianist and runs his own piano studio. All of her siblings play stringed instruments as well, and she loves performing with her family members. In addition to violin, Azayra loves singing and has been in choir since fifth grade. Her senior year she was a member of the Texas All-State Womens choir and additionally, her Varsity high school choir won several awards throughout her time there. She is excited to be a member of our team here at Music and Arts in Waco and looks forward to teaching the students here. Request Lessons with Azayra today!